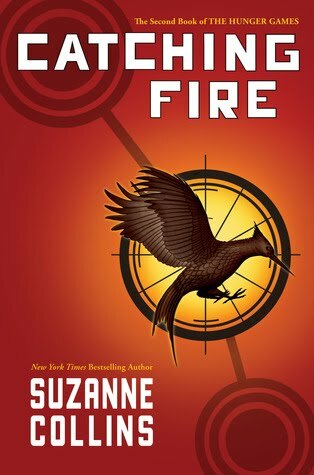 I should have posted this post days ago (I owe that much to Cass my secret santa who send me Catching Fire) but I wanted to finish the book before I wrote anything. So now that I have here is goes. THANKyou THANKyou THANKyou THANKyou THANKyou THANKyou THANKyou THANKyou so much! I loved 'Catching Fire'. Katniss is definitely one of my favorite fictional characters. I love how she is so the unexpected hero. She doesn't even know it herself. Every time someone tried to force her to work for them she manages to cramp their style and continues to give hope to all the people of the districts. I think this is the only reason why I read this book because everyone bossing her around all the time makes me so angry but she just gets on with life and continues to fight for what (or should I say who) she believes in. The Peeta Gale situation is becoming almost comical. I can't work out why either of them like her because she's never done anything for them. Well... I can't work out why Peeta liked her before the Hunger Games because she never did anything for him. On that note I think I'm beginning to become a member of team Gale just because Gale doesn't force his attentions on Katniss. She never asked for Peeta to like her and should not have to listen (suffer) that added worry. On the other hand... I'll admit he does do some pretty cool thing to save her life (none of which she asked for) but still cool all the same. At the end of the day I am always going to be Team Katniss because I believe that any women should be allowed to chose freely and not be forced into a relationship that they feel guilty about. Katniss will always be in Peeta's debt and I don't want her loving him just because she knows what he did in order to save her life (assuming he survives book 3. That would be a great way to end the Peeta Gale competition–kill off Peeta..... sorry team Peeta I don't mean it of cause because then Katniss would never be happy with Gale knowing she only chose him cause Peeta didn't make it). Anyway enough of the rant. You guys have probably heard this all before. I know I'm a little behind the times. Thanks again to Cass of Words on Paper. I will always love this book!